They say the investigator has to prove that only the president can give him the answers he's after. 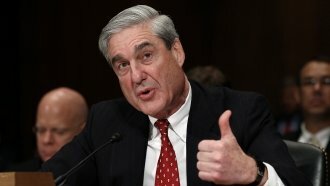 President Donald Trump's lawyers are saying special counsel Robert Mueller's team hasn't met the requirements needed to score an interview with the president. That's despite Trump saying he's "looking forward" to and would "love to" meet with Mueller. But Trump also said he'd ultimately defer to his lawyers on the matter. Mueller said he wanted to talk to the president as part of the Russia investigation last week. He even reportedly provided Trump's lawyers with a list of topics he would ask about. Trump's lawyers want Mueller to prove only the president can give him the answers he's looking for before they'll agree to an interview. The White House has allowed others close to Trump to be interviewed, but his lawyers say the president shouldn't be treated like everyone else.